1. "Nature's Cures" - A $39.95 value - Only $19.97! 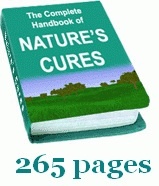 Finally, there's a comprehensive guide to natural cures for common health problems. With this simple download you get over 250 information-packed pages listing natural and herbal remedies for dozens of ailments, including allergies, asthma, acne, high blood pressure, cancer, diabetes, hypoglycemia, influenza, gastritis, pruritus, obesity, ulcers, hemorrhoids, bronchitis, plus many more! And that's not all. This guide also explains how you can be helped by many alternative modalities like Yoga, Meditation, Color Therapy, Massage, Fasting, and Bathing. If you've ever suffered from the harmful side effects of medicine, or if you just want to follow an easy natural way to regain and reclaim your health, this ebook is for you. 2. 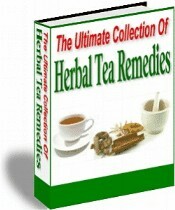 "The Ultimate Collection of Herbal Teas" - Only $4.95! Ever wonder what herbal teas to drink for a cold, cough, headache, upset stomach, or other complaint? This ebook will tell you which teas, plus how to brew them, and much more. Only $4.95! This small investment in your health will pay huge gains. 3. Three Ebooks: "Intro to Yoga," "Yoga Exercises," and "Advanced Yoga Techniques" - Over 500 Pages - Only $14.95! Learn how to calm your inner anxieties while gaining a more youthful, relaxed appearance. These three ebooks take you step by step through basic beginners yoga and meditation up to advanced postures and techniques. A superb value - over 500 total pages - to help your physical and mental health, for only $14.95!